The more information you have the better your wireless network design will be. While there's no one single answer that will work for everyone, setting your business or organization up for success involves gathering more data. 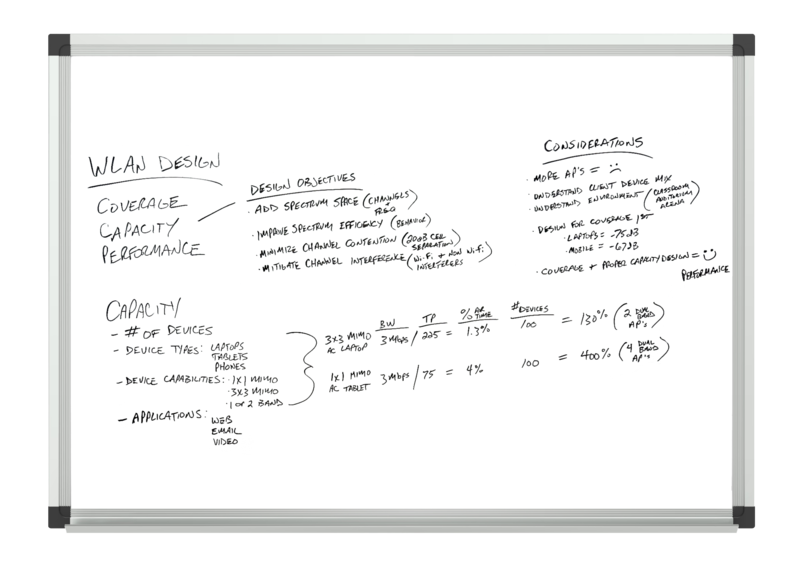 In our first ever Whiteboard video, Michael McNamee (Senior Network Engineer) at SecurEdge Networks explains what capacity in today's world means and what you need to look for when creating a wireless network designed for capacity. Click on the whiteboard image above to open a high resolution image. 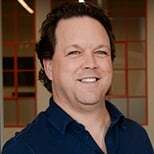 Hi, I'm Michael McNamee with SecurEdge Networks. I'm the Senior Network Engineer here over the wireless mobility practice. Today we're going to talk about wireless design, and specifically how it pertains to doing a capacity design. Historically in wireless design, we've traditionally just done coverage. That's X number of APs for a given area, and it provides this much signal level. That was fairly easy to do, but as wireless evolved and the devices evolved we've now had to address capacity concerns. Capacity really necessitates gathering more information to understand what we're actually designing for. When we talk about capacity, we're looking at the number of devices in a given space. That gives us an understanding of how much demand there's going to be on the network. On top of that, it's helpful to understand or almost critical to understand what types of devices that we're addressing, whether we're doing laptops, tablets, phones. I'll address that and explain why that's necessary. 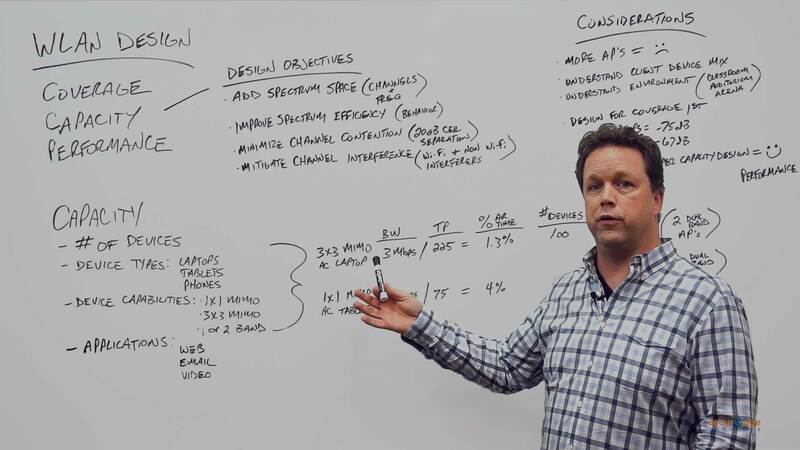 On top of that, what the device capabilities are whether they're a single stream MIMO device, a single spatial stream, or a three spatial stream MIMO device, or even if the devices can do one or two bands or both. And then, understanding the applications that the devices are going to be using within the space. Going back to the device capabilities, I'll give you an example of why that's necessary or why that's impactful to the design for us. Let's take, for instance, a high end three by three, three spatial stream MIMO AC laptop. Let's just say for the example we're gonna use three megabits as our requirement for the bandwidth per device. It could be because of the application that the users are running, they're going to need about three megabits each. We take the throughput which for this example we're going to use 225. The AC laptop, if everything is optimal, this can do up to 450 megabits. But we're never going to see that potential data rate as actual throughput because wireless is a shared medium and it's half duplex. We're only going to see about half of that, which is what we use as a rule of thumb. Let's take that three megabit, divide it by the 225 megabit throughput rate that we're going to get on the laptop, and that gives us 1.3% of air time. That tells us this one single laptop is going to take up to 1.3% of the air time on the wireless network. If we multiply that times the number of devices, let's say, these laptops are in an auditorium, there are 100 users. So this is gonna give us an understanding of how much air time these devices are going to consume. So 100 times 1.3% gives us 130%. That tells us that we're going to need, at least, two dual band access points to address all those users. Now on the flip side, if we look at an AC tablet which is a single stream spatial device, we're still using that same three megabit requirement. The tablet only was going to be able to do about 75 megabit throughput. The data rate connection on the wireless device is going to be about 150. We're only going to realize half of that, so that gives us 75 megabit. We divide that out and that tells us that that tablet's going to take up to 4% of air time all by itself. Already we can see that that's three times what the laptop would consume. We multiply that out times 100 devices in the auditorium, and that tells us they're going to consume 400% of the air time, which means we need four dual band access points. Understanding the devices, their capabilities, and the applications really becomes critical for the capacity design so that we're addressing those specific needs and demands. The other side of it is we have specific objectives that we want to be cognizant of and make sure that we're not inflicting more harm on ourselves as we're doing the design than we're resolving. Number one is we want to add spectrum space. That could be the channels that we're using and the frequencies. In certain frequencies we only have a certain number of channels. We don't want to use those more than one time in a certain space so that we don't increase the co-channel contention. We also want to improve spectrum efficiency so the behavior or the performance of the spectrum in that space. We also want to minimize the channel contention. Between channels we want to have a cell that's using a different channel than the one that we're on. If there is any type of overlap, we want to make sure that there's at least 20 dB of separation between us so that our client devices aren't sharing the same RF domain and having to increase their wait time because of another cell using the same channel. We want to mitigate channel interference, either Wi-Fi contention that we've imposed on ourselves because we're trying to place too many access points using the same channels in the same space or even non-Wi-Fi interference that sometimes we don't have as much control over. We need to make sure that we're addressing those. After we consider all these different points for the wireless LAN design, we want to touch on these different considerations. Number one, just adding more APs to a space is not a solution. That can actually create more deficiency than it solves. It's important to understand the client device mix, what devices, what applications, and what's their capability. We want to understand the environment. Is this a classroom? Is it an auditorium? Is it an arena? How dense are the users in the area? What is the construction material? Where are our mounting or placing for the access points going to happen? We want to always design for coverage first. We want to make sure that the signal level for a laptop is at least neg 75 and a mobile device is neg 67. Even between the devices, they require a different level of RSSI or signal level. Once we've addressed coverage and then we couple that with our proper capacity design, then we can achieve good performance for our wireless LAN. Hopefully, that was helpful for you guys. If you have any questions or you want to learn more about wireless LAN design, reach out to us at www.securedgenetworks.com/blog. Have a good one.